OneWorld Now!’s integrated program model includes language, leadership and study abroad, with a commitment to making these transformational opportunities accessible to all youth. Whereas many programs nationwide offer aspects of the OWN model, OneWorld Now!’s is one of the only programs in the nation with this holistic approach towards international education. OneWorld Now! 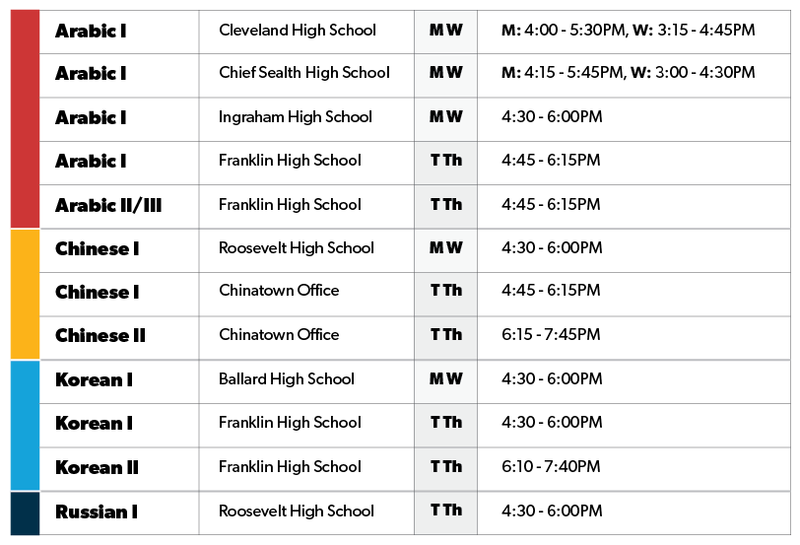 works with youth from every high school in the Seattle Public School District. Participants apply for the program at the start of the school year and commit to our academic-year Global Leadership Program. Twice weekly, students take after school critical world language classes in Mandarin Chinese, Arabic, Korean or Russian. These languages were chosen because they are less commonly taught in U.S. schools but are widely used world languages that will be beneficial for future global leaders. Below is the tentative class schedule for the 2018-2019 program. The schedule is subject to change based on demand and enrollment. OneWorld Now!’s Office is located in downtown Seattle at 610 Maynard Avenue South. It is a short walk from the International District bus tunnel stop. The leadership component combines monthly leadership workshops and regular community service opportunities together with peers from across Seattle. Leadership workshops are facilitated sessions using experiential learning methods that build positive social identities, intercultural sensitivity and an expanded sense of global citizenship within each student. In the end, students realize their potential as leaders in their community and in their own life, and are empowered to do their part to make a positive change in the world. 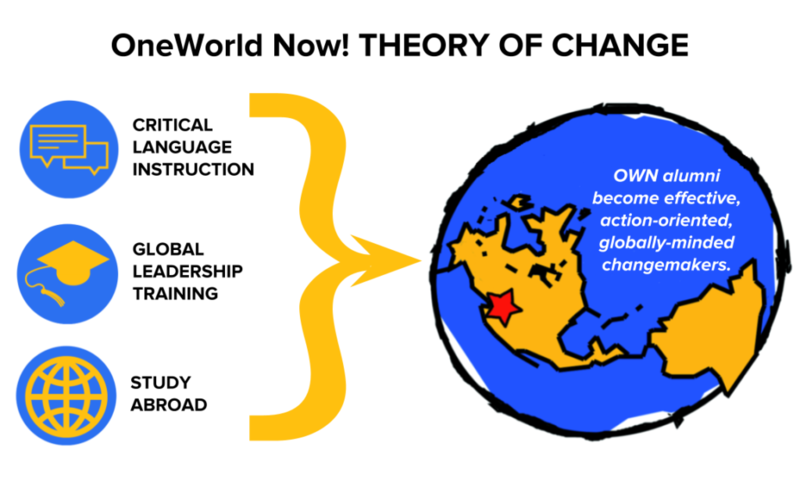 The leadership portion of OWN’s programming is based on a uniquely designed curriculum involving a series of workshops that set youth on a course toward becoming global citizens concerned with social justice and equality. The full leadership curriculum covers four thematic areas. Who am I . . . on the inside? Learning outcomes here include the ability to slow down and examine assumption-making processes; describe negative self-talk, and emphasize opportunity over obstacles. Who am I . . . in relation to power in society? Students gain the ability to identify multiple social identities while gaining an understanding of the systems and behaviors that allow for inequality and injustices and how we can work to counter them. Who am I . . . in relation to other? Learning outcomes include the ability to let go of what makes sense to you to understand what makes sense to others, and the ability to find similarities while also appreciating differences. Who am I . . . in this great, big world? Students gain a personal understanding of global interconnectedness, and an enhanced sense of responsibility to affect change, both locally and globally. Sending youth abroad is probably the most transformative experience of all the components of OneWorld Now!. Students return from these programs with an expanded worldview, a passion for pursuing additional travel opportunities, and a much clearer vision and commitment to pursuing higher education and achieving their long-term goals. The typical OWN study abroad experience involves a homestay, service learning project, and continued language study. OneWorld Now!’s vision is that all young people have access to transformative international education. Since its founding, OWN has been committed to making these opportunities accessible to economically disadvantaged youth, who have historically had the least exposure and opportunities to gain language, leadership skills and study abroad participation. Therefore, tuition for the language and leadership portion of our Global Leadership Program is offered on a sliding-scale based on household income.